This edition of our new Infrastructure Intermission feature focuses on water towers and windmills. It can be easy to forget about the journey that clean, potable water takes to get to your faucet. From subterranean aquifers, pipes coursing through walls under plaster and drywall, and the treatment plant tucked away on the edge of town, much of our water supply is out of sight and often out of mind. But in almost every community there are at least two pieces of water infrastructure that are highly visible on the landscape—water towers and windmills. The earliest municipal water systems in the U.S. were primitive, often relying on natural springs and hollow log pipes, but the Industrial Revolution saw Americans’ demands for water grow exponentially. By providing both water storage capacity while pressurizing the entire distribution system, elevated water towers solved important reliability and functionality problems for civil engineers. Instead of relying on massive pumps running constantly to supply the entire system, smaller pumps could drive water into the tank when needed and the steady force of gravity could take it from there. Some of the earliest tanks were essentially large wooden barrels installed on rooftops to provide water to individual buildings. As needs continued to swell, cities began to install their own municipal water towers—often steel tanks hoisted into the air on spindly legs, or later, all-in-one “monopod” towers that contained the structural supports, pumps, distribution pipes, and service needs within a single metal or concrete housing. The Shamrock Water Tower, one of the tallest in the state, was built in 1915 and designated a Recorded Texas Historic Landmark (RTHL) in 2008. 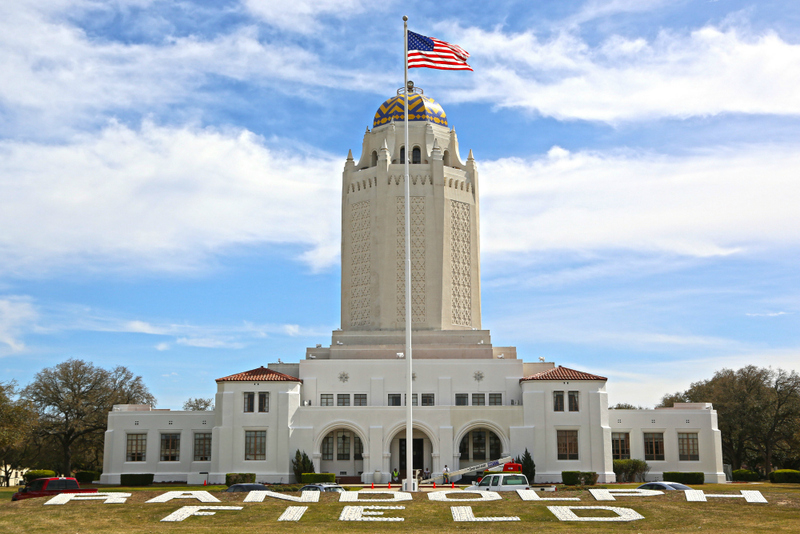 The Administration Building at Randolph Air Force Base outside San Antonio, nicknamed the Taj Mahal, not only houses offices, but the central tower also holds a 500,000-gallon water tank. The building was designated an RTHL in 1975, listed in the National Register of Historic Places in 1987, and is part of the Randolph Field Historic District, which was designated a National Historic Landmark in 1996. The Roma Water Tower was constructed by the Works Progress Administration in 1940 and illustrates the clean geometric lines common to the era’s architecture. It is believed to be one of the earliest concrete monopod towers. 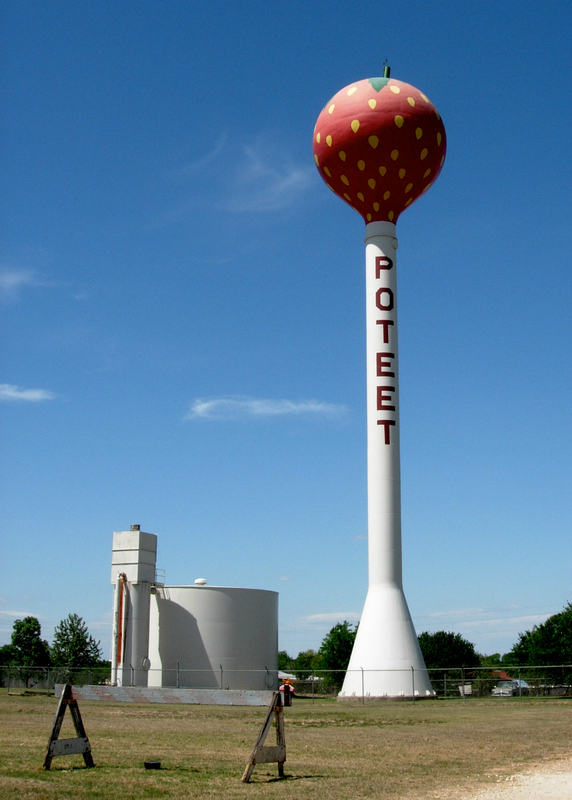 Of course, there are countless other water towers across the state notable for their artistry, such as those in Luling (home of the annual Watermelon Thump), Poteet (which hosts the Strawberry Festival each year), or the leaning water tower of Groom. But without a steady supply of fresh water, water towers and distribution systems would do consumers no good. In urban areas, this might necessitate a gas or electric motor to pump water from its source, but in rural areas the more common solution is to use a windmill, which uses the natural energy of the wind to drive a piston, pumping ground water up to the surface. Areas like the Panhandle were forever changed by this simple invention, which provided access to the vast underground water resources of the Ogallala Aquifer and alllowed for more intensive agricultural use of the land than ever before. Since its invention in 1854, these self-governing windmills or windpumps have become a fixture on the American landscape. 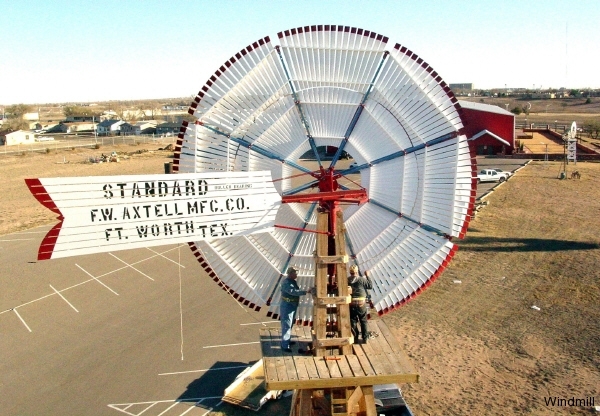 Some of the ways you can learn more about the subject are by joining fellow windmill enthusiasts, or molinologists, by visiting the American Wind Power Center in Lubbock, the J.B. Buchanan Windmill Park in Spearman, or the Dutch Windmill Museum in Nederland. 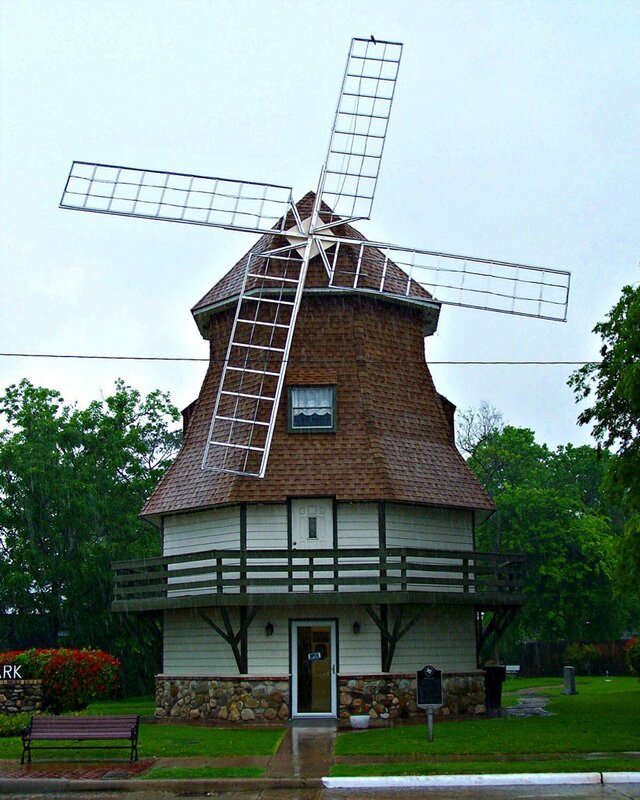 You can also subscribe to the Windmillers’ Gazette, a quarterly publication on the history of windmills and wind power. How is local pride displayed on your hometown water tower? 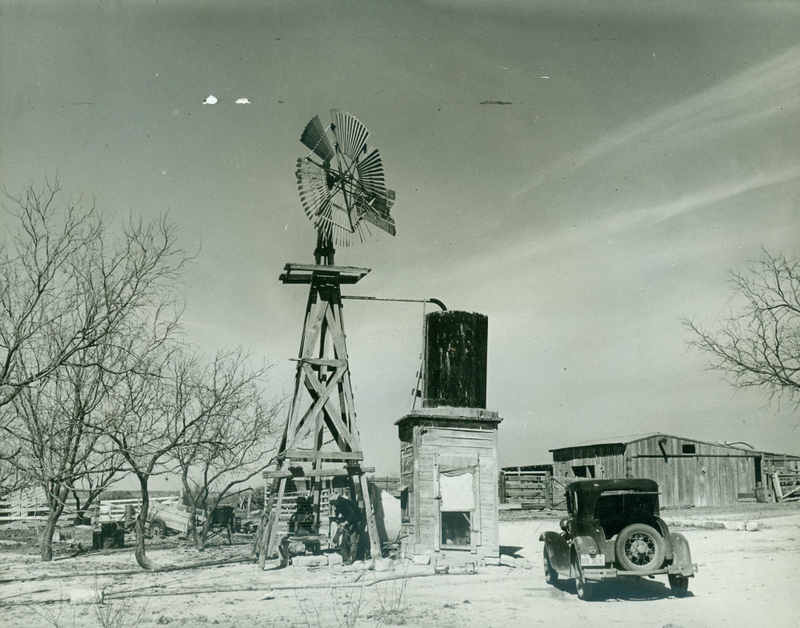 Have any photographs of classic Texas agricultural scenes featuring windmills? Share some of your favorites with us and the Texas Water Development Board on Instagram. Tag your photos #TXWindmills and #TXwatertowers during July 2016 for a chance to win a prize. Learn more here. 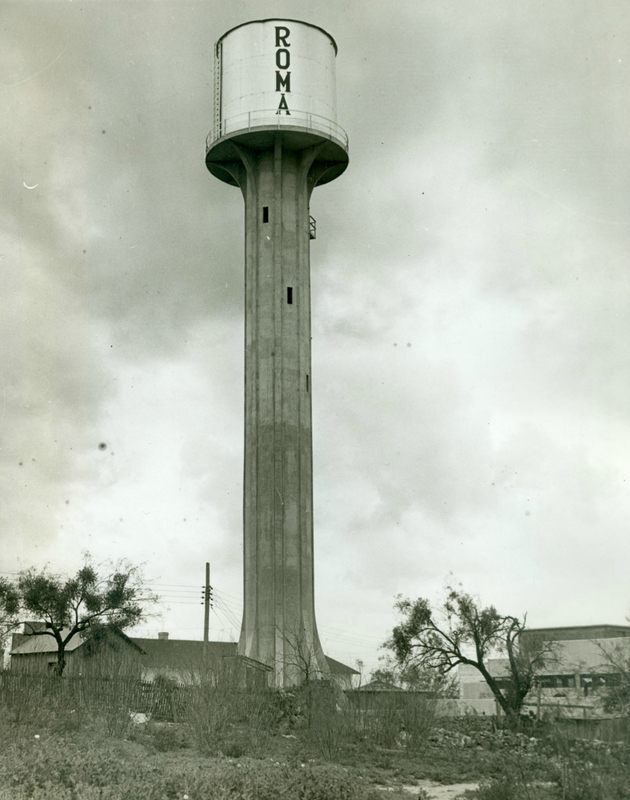 Roma Water Tower, National Archives and Records Administration, via the Texas Parks and Wildlife Department’s “Texas and the WPA” Project on Flickr.